New Report Added to The Trac System! 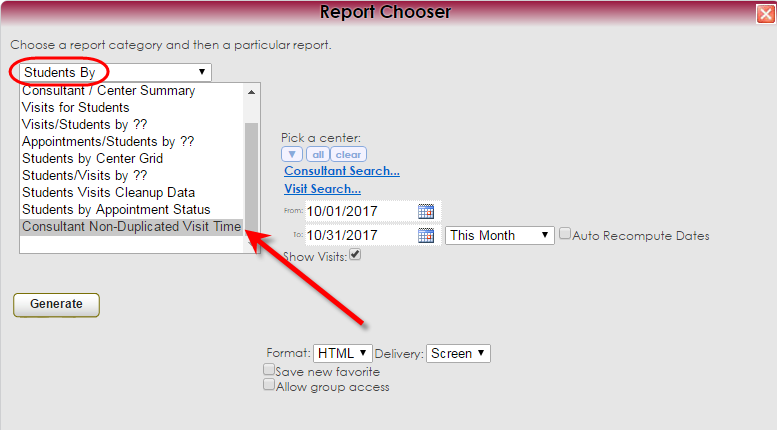 The Trac system is adding a new report called "Consultant Non-Duplicated Visit Time" This report will show unique, non-overlapping visit times by Consultant. For example if a Consultant has a 1 hour long 3 person Group in most reports total tutoring time would be reported as 3 Hours, one for each student. While this is important and accurate information some users need the ability to report on the unique time that the CONSULTANT is working. In our Example above the Tutor worked for 1 hour while providing 3 visit hours’ worth of time. For certain Programs, like CRLA, knowing this non overlapping visit time can assist in determining accreditation requirements. 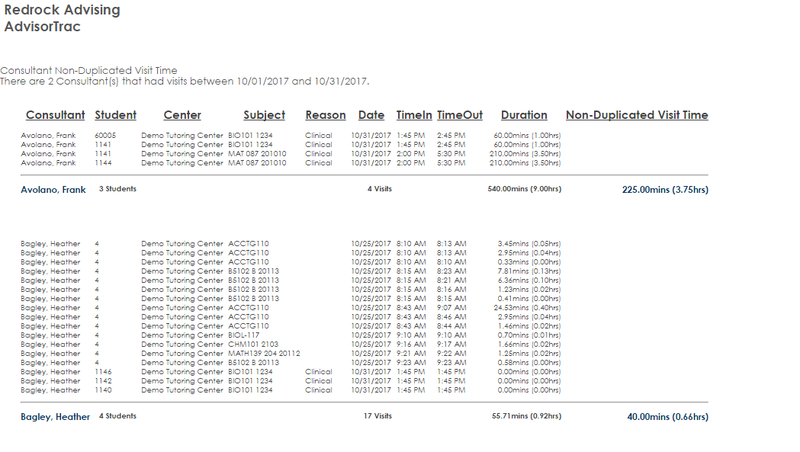 Pick a Center: Users can choose one or more Centers to report on. If left blank it will default to all Centers the user has access to. Consultant Search: Filter your report by various Consultant based fields like Name, Location or Classification. Visit Search: Filter your Report by various Visit Fields like Subject and Reason. Show Visits: This lets you select a detailed version of the report with individual visits listed or an abbreviated version of the report with Totals only. This Version of the report is sorted by Consultant with each line showing an individual Student visit. The Totals line for each Consultant shows Consultant Name, Total number of unique Students, Total Visits, total overall Visit time and then the Non-duplicated Visit Time. This version has two columns, Consultant name and Total non-duplicated hours. We hope that you find this newsletter helpful and as always if you have any questions on this or any other features, please feel free to let us by emailing Helpdesk@go-redrock.com or submitting a ticket. Enter any comments below.